Semi-circle double rainbow (second one barely discernible) in Wrangell-St. Elias National Park, Alaska. Supernumerary rainbows can be seen on the inside of the primary arc. The sky inside the primary bow is brighter than that outside. A rainbow is an optical and meteorological phenomenon that causes a spectrum of light to appear in the sky when the Sun shines onto droplets of moisture in the Earth's atmosphere. It takes the form of a multicolored arc, with red on the outer edge of the arc and violet on the inner edge. Occasionally, a secondary rainbow is seen, which appears as a fainter arc outside the primary arc, with colors in the opposite order, that is, with violet on the outside and red on the inside. Rainbows can be caused by forms of water other than rain, including mist, spray, and dew. A rainbow spans a continuous spectrum of colors. Traditionally, however, the colors are cited in sequence, as though they were quantized. The most commonly cited sequence in English consists of the seven colors noted by Isaac Newton: red, orange, yellow, green, blue, indigo, and violet. Popular mnemonics for this sequence are "Roy G. Biv" and "Richard Of York Gave Battle In Vain". 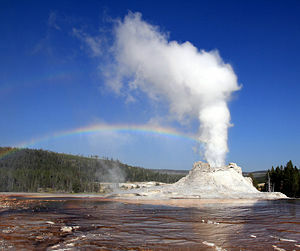 Steam phase eruption of Castle Geyser demonstrates primary and secondary rainbows and Alexander's band at Yellowstone National Park. 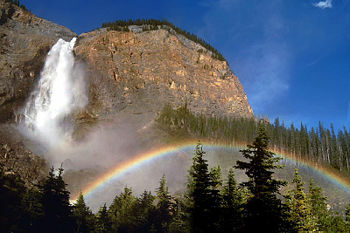 Rainbows may also form in mist, such as that of a waterfall. Rainbows may also form in the spray created by waves (called spray bows). Rainbows can be observed whenever there are water drops in the air and sunlight shining from behind a person at a low altitude angle (on the ground). The most spectacular rainbow displays happen when half of the sky is still dark with draining clouds and the observer is at a spot with clear sky in the direction of the Sun. The result is a luminous rainbow that contrasts with the darkened background. The rainbow effect is also commonly seen near waterfalls or fountains. The effect can also be artificially created by dispersing water droplets into the air during a sunny day. Rarely, a moonbow, lunar rainbow or night-time rainbow, can be seen on strongly moonlit nights. As human visual perception for color is poor in low light, moonbows are often perceived to be white. It is difficult to photograph the complete arc of a rainbow, as this would require an angle of view of 84°. For a 35 mm camera, a lens with a focal length of 19 mm or less wide-angle lens would be required. From an aeroplane, one has the opportunity to see the whole circle of the rainbow, with the plane's shadow in the centre. This phenomenon can be confused with the glory, but a glory is usually much smaller, covering only 5°–20°. The light is first refracted as it enters the surface of the raindrop, reflected off the back of the drop, and again refracted as it leaves the drop. The overall effect is that the incoming light is reflected back over a wide range of angles, with the most intense light at an angle of 40°–42°. The angle is independent of the size of the drop, but does depend on its refractive index. Seawater has a higher refractive index than rain water, so the radius of a 'rainbow' in sea spray is smaller than a true rainbow. This is visible to the naked eye by a misalignment of these bows. The amount by which light is refracted depends upon its wavelength, and hence its color. Blue light (shorter wavelength) is refracted at a greater angle than red light, but because the area of the back of the droplet has a focal point inside the droplet, the spectrum crosses itself, and therefore the red light appears higher in the sky, and forms the outer color of the rainbow. Contrary to popular belief, the light at the back of the raindrop does not undergo total internal reflection and some light does emerge from the back. However, light coming out the back of the raindrop does not create a rainbow between the observer and the sun because spectra emitted from the back of the raindrop do not have a maximum of intensity, as the other visible rainbows do, and thus the colors blend together rather than forming a rainbow. Light rays enter a raindrop from one direction (typically a straight line from the Sun), reflect off the back of the raindrop, and fan out as they leave the raindrop. The light leaving the rainbow is spread over a wide angle, with a maximum intensity at 40.6°–42°. White light separates into different colors (wavelengths) on entering the raindrop because red light is refracted by a lesser angle than blue light. 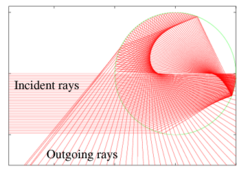 On leaving the raindrop, the red rays have turned through a smaller angle than the blue rays, producing a rainbow. A rainbow does not actually exist at a particular location in the sky. Its apparent position depends on the observer's location and the position of the sun. All raindrops refract and reflect the sunlight in the same way, but only the light from some raindrops reaches the observer's eye. This light is what constitutes the rainbow for that observer. The position of a rainbow in the sky is always in the opposite direction of the Sun with respect to the observer, and the interior is always slightly brighter than the exterior. The bow is centered on the shadow of the observer's head, or more exactly at the antisolar point (which is below the horizon during the daytime), appearing at an angle of 40°–42° to the line between the observer's head and its shadow. As a result, if the Sun is higher than 42°, then the rainbow is below the horizon and cannot be seen as there are not usually sufficient raindrops between the horizon (that is: eye height) and the ground, to contribute. Exceptions occur when the observer is high above the ground, for example in an airplane (see above), on top of a mountain, or above a waterfall. Some light reflects twice inside the raindrop before exiting to the viewer. When the incident light is very bright, this can be seen as a secondary rainbow, brightest at 50°–53°. 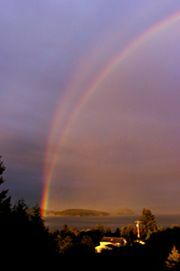 A double rainbow features reversed colors in the outer (secondary) bow, with the dark Alexander's band between the bows. Occasionally, a second, dimmer, and thicker secondary rainbow is seen outside the primary bow. Secondary rainbows are caused by a double reflection of sunlight inside the raindrops, and appear at an angle of 50°–53°. 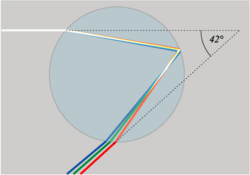 As a result of the second reflection, the colors of a secondary rainbow are inverted compared to the primary bow, with blue on the outside and red on the inside. The dark area of unlit sky lying between the primary and secondary bows is called Alexander's band, after Alexander of Aphrodisias who first described it. A third, or tertiary, rainbow can be seen on rare occasions, and a few observers have reported seeing quadruple rainbows in which a dim outermost arc had a rippling and pulsating appearance. These rainbows would appear on the same side of the sky as the Sun, making them hard to spot. One type of tertiary rainbow carries with it the appearance of a secondary rainbow immediately outside the primary bow. The closely spaced outer bow has been observed to form dynamically at the same time that the outermost (tertiary) rainbow disappears. During this change, the two remaining rainbows have been observed to merge into a band of white light with a blue inner and red outer band. 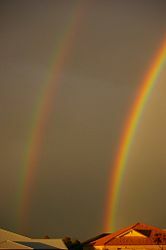 This particular form of doubled rainbow is not like the classic double rainbow due to both spacing of the two bows and that the two bows share identical normal color positioning before merging. With both bows, the inner color is blue and the outer color is red. 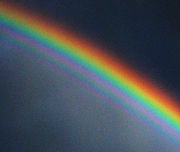 Higher-order rainbows were described by Felix Billet (1808-1882) who depicted angular positions up to the 19th-order rainbow. A pattern he called “rose”. In the laboratory, it is possible to observe higher-order rainbows by using extremely bright and well collimated light produced by lasers. A sixth-order rainbow was first observed by K. Sassan in 1979 using a HeNe laser beam and a pendant water drop. Up to the 200th-order rainbow was reported by Ng et al. in 1998 using a similar method but an argon ion laser beam . A contrast-enhanced photograph of a supernumerary rainbow, with additional green and purple arcs inside the primary bow. Primary and secondary rainbows are visible, as well as a reflected primary and a faintly visible reflected secondary. A supernumerary rainbow is an infrequent phenomenon, consisting of several faint rainbows on the inner side of the primary rainbow, and very rarely also outside the secondary rainbow. Supernumerary rainbows are slightly detached and have pastel color bands that do not fit the usual pattern. It is not possible to explain their existence using classical geometric optics. The alternating faint rainbows are caused by interference between rays of light following slightly different paths with slightly varying lengths within the raindrops. Some rays are in phase, reinforcing each other through constructive interference, creating a bright band; others are out of phase by up to half a wavelength, cancelling each other out through destructive interference, and creating a gap. Given the different angles of refraction for rays of different colors, the patterns of interference are slightly different for rays of different colors, so each bright band is differentiated in color, creating a miniature rainbow. Supernumerary rainbows are clearest when raindrops are small and of similar size. 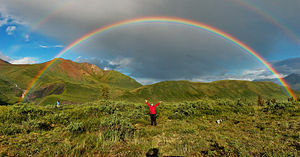 The very existence of supernumerary rainbows was historically a first indication of the wave nature of light, and the first explanation was provided by Thomas Young in 1804. Special rainbows may appear when a rainbow is seen above a body of water, if the water surface is quiet. 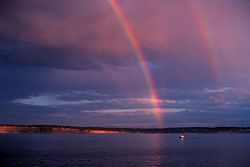 A reflected rainbow will appear as a mirror image below the horizon (see photo above). The sunlight is first deflected by the raindrops, and then reflected off the body of water, before reaching the observer. The reflected rainbow is frequently visible, at least partially, even in small puddles. Where sunlight reflects off a body of water before reaching the raindrops (see diagram), it may produce a reflection rainbow (see photo at the right), if the water body is large, and quiet over its entire surface, and close to the rain curtain. The reflection rainbow appears above the horizon. It intersects the normal rainbow at the horizon, and its arc reaches higher in the sky. Due to the combination of requirements, a reflection rainbow is rarely visible. The circumhorizontal arc is sometimes referred to by the misnomer 'fire rainbow'. As it originates in ice crystals it is not a rainbow but a halo. It has been suggested that rainbows might exist on Saturn's moon Titan, as it has a wet surface and humid clouds. The radius of a Titan rainbow would be about 49° instead of 42°, because the fluid in that cold environment is methane instead of water. A visitor might need infrared goggles to see the rainbow, as Titan's atmosphere is more transparent for those wavelengths. The Iraqi physicist and polymath, Ibn al-Haytham (Alhazen; 965-1039), attempted to provide a scientific explanation for the rainbow phenomenon. In his Maqala fi al-Hala wa Qaws Quzah (On the Rainbow and Halo), he "explained the formation of rainbow as an image, which forms at a concave mirror. 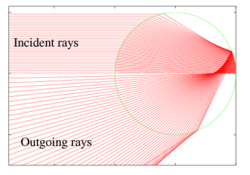 If the rays of light coming from a farther light source reflect to any point on axis of the concave mirror, they form concentric circles in that point. When it is supposed that the sun as a farther light source, the eye of viewer as a point on the axis of mirror and a cloud as a reflecting surface, then it can be observed the concentric circles are forming on the axis." He was not able to verify this because his theory that "light from the sun is reflected by a cloud before reaching the eye" did not allow for a possible experimental verification. This explanation was later repeated by Averroes, and, though incorrect, provided the groundwork for the correct explanations later given by Kamāl al-Dīn al-Fārisī and Theodoric of Freiberg. Ibn al-Haytham's contemporary, the Persian philosopher and polymath Ibn Sīnā (Avicenna; 980-1037), provided an alternative explanation, writing "that the bow is not formed in the dark cloud but rather in the very thin mist lying between the cloud and the sun or observer. The cloud, he thought, serves simply as the background of this thin substance, much as a quicksilver lining is placed upon the rear surface of the glass in a mirror. Ibn Sīnā would change the place not only of the bow, but also of the color formation, holding the iridescence to be merely a subjective sensation in the eye." This explanation, however, was also incorrect. In Song Dynasty China (960–1279), a polymathic scholar-official named Shen Kuo (1031–1095) hypothesized—as a certain Sun Sikong (1015–1076) did before him—that rainbows were formed by a phenomenon of sunlight encountering droplets of rain in the air. Paul Dong writes that Shen's explanation of the rainbow as a phenomenon of atmospheric refraction "is basically in accord with modern scientific principles." The Persian astronomer, Qutb al-Din al-Shirazi (1236–1311), gave a fairly accurate explanation for the rainbow phenomenon. This was elaborated on by his student, Kamāl al-Dīn al-Fārisī (1260–1320), who gave a more mathematically satisfactory explanation of the rainbow. He "proposed a model where the ray of light from the sun was refracted twice by a water droplet, one or more reflections occurring between the two refractions." He verified this through extensive experimentation using a transparent sphere filled with water and a camera obscura. As he noted in his Kitab Tanqih al-Manazir (The Revision of the Optics), al-Farisi used a large clear vessel of glass in the shape of a sphere, which was filled with water, in order to have an experimental large-scale model of a rain drop. He then placed this model within a camera obscura that has a controlled aperture for the introduction of light. He projected light unto the sphere and ultimately deducted through several trials and detailed observations of reflections and refractions of light that the colors of the rainbow are phenomena of the decomposition of light. His research had resonances with the studies of his contemporary Theodoric of Freiberg (without any contacts between them; even though they both relied on Ibn al-Haytham's legacy), and later with the experiments of Descartes and Newton in dioptrics (for instance, Newton conducted a similar experiment at Trinity College, though using a prism rather than a sphere). In Europe, Ibn al-Haytham's Book of Optics was translated into Latin and studied by Robert Grosseteste. His work on light was continued by Roger Bacon, who wrote in his Opus Majus of 1268 about experiments with light shining through crystals and water droplets showing the colors of the rainbow. Theodoric of Freiberg is known to have given an accurate theoretical explanation of both the primary and secondary rainbows in 1307. He explained the primary rainbow, noting that "when sunlight falls on individual drops of moisture, the rays undergo two refractions (upon ingress and egress) and one reflection (at the back of the drop) before transmission into the eye of the observer." He explained the secondary rainbow through a similar analysis involving two refractions and two reflections. Descartes 1637 treatise, Discourse on Method, further advanced this explanation. Knowing that the size of raindrops did not appear to affect the observed rainbow, he experimented with passing rays of light through a large glass sphere filled with water. 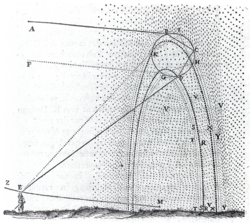 By measuring the angles that the rays emerged, he concluded that the primary bow was caused by a single internal reflection inside the raindrop and that a secondary bow could be caused by two internal reflections. He supported this conclusion with a derivation of the law of refraction (subsequently, but independently of, Snell) and correctly calculated the angles for both bows. His explanation of the colors, however, was based on a mechanical version of the traditional theory that colors were produced by a modification of white light. Isaac Newton demonstrated that white light was composed of the light of all the colors of the rainbow, which a glass prism could separate into the full spectrum of colors, rejecting the theory that the colors were produced by a modification of white light. He also showed that red light gets refracted less than blue light, which led to the first scientific explanation of the major features of the rainbow. Newton's corpuscular theory of light was unable to explain supernumerary rainbows, and a satisfactory explanation was not found until Thomas Young realized that light behaves as a wave under certain conditions, and can interfere with itself. Young's work was refined in the 1820s by George Biddell Airy, who explained the dependence of the strength of the colors of the rainbow on the size of the water droplets. Modern physical descriptions of the rainbow are based on Mie scattering, work published by Gustav Mie in 1908. Advances in computational methods and optical theory continue to lead to a fuller understanding of rainbows. For example, Nussenzveig provides a modern overview. The end of a rainbow. The rainbow has a place in legend owing to its beauty and the historical difficulty in explaining the phenomenon. In Greek mythology, the rainbow was considered to be a path made by a messenger (Iris) between Earth and Heaven. In Chinese mythology, the rainbow was a slit in the sky sealed by Goddess Nüwa using stones of five different colors. In Hindu mythology, the rainbow is called "Indradhanush," meaning the bow (Sanskrit & Hindi: dhanush is bow of Indra, the deity of lightning, thunder and rain. In Norse Mythology, a rainbow called the Bifröst Bridge connects the realms of Ásgard and Midgard, homes of the gods and humans, respectively. The Irish leprechaun's secret hiding place for his pot of gold at "the end of the rainbow" is impossible to reach, because the rainbow is an optical effect which depends on the location of the viewer. Walking towards the end of a rainbow will cause it to move further away. I have set my bow in the clouds, and it shall be a sign of the covenant between me and the earth. When I bring clouds over the earth and the bow is seen in the clouds, I will remember my covenant that is between me and you and every living creature of all flesh; and the waters shall never again become a flood to destroy all flesh. Then Ishtar arrived. She lifted up the necklace of great jewels that her father, Anu, had created to please her and said, "Heavenly gods, as surely as this jeweled necklace hangs upon my neck, I will never forget these days of the great flood. Let all of the gods except Enlil come to the offering. Enlil may not come, for without reason he brought forth the flood that destroyed my people." The rainbow occurs often in paintings. Frequently these have a symbolic or programmatic significance (for example, Albrecht Dürer's Melancholia I). 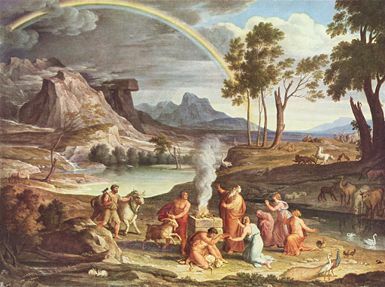 In particular, the rainbow appears regularly in religious art (for example, Joseph Anton Koch's Noah's Thanksoffering). Romantic landscape painters such as Turner and Constable were more concerned with recording fleeting effects of light (for example, Constable's Salisbury Cathedral from the Meadows). Other notable examples appear in work by Hans Memling, Caspar David Friedrich, and Peter Paul Rubens. 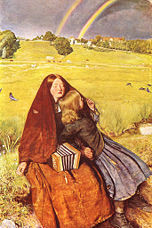 The Blind Girl, oil painting (1856) by John Everett Millais. The rainbow – one of the beauties of nature that the blind girl cannot experience – is used to underline the pathos of her condition. Noah's Thanksoffering (c.1803) by Joseph Anton Koch. Noah builds an altar to the Lord after being delivered from the Flood; God sends the rainbow as a sign of his covenant (Genesis 8-9). "My title is from Keats, who believed that Newton had destroyed all the poetry of the rainbow by reducing it to the prismatic colors. Keats could hardly have been more wrong, and my aim is to guide all who are tempted by a similar view, towards the opposite conclusion. Science is, or ought to be, the inspiration for great poetry." Historically, a rainbow flag was used in the German Peasants' War in the sixteenth century as a sign of a new era, of hope and of social change. Rainbow flags have also been used as a symbol of the Cooperative movement; as a symbol of peace, especially in Italy; to represent the Tawantin Suyu, or Inca territory, in Peru and Ecuador; by some Druze communities in the Middle East; and by the Jewish Autonomous Oblast. The rainbow appears on the Gay pride flag, designed by Gilbert Baker for the 1978 San Francisco's Gay Freedom Celebration and today it is often used to represent LGBT-friendly businesses or districts. All the "Roy G. Biv" mnemonics follow the tradition of including the color indigo between blue and violet. Newton originally (1672) named only five primary colors: red, yellow, green, blue and violet. Only later did he introduce orange and indigo, giving seven colors by analogy to the number of notes in a musical scale. Some sources now omit indigo, because it is a tertiary color and partly due to the poor ability of humans to distinguish colors in the blue portion of the visual spectrum. There is also some evidence that Newton's use of the terms blue and indigo map to the modern hues cyan and blue respectively. Since rainbows are composed of a nearly continuous spectrum, different people, most notably across different cultures identify different numbers of colors in rainbows. Red = , Orange = , Yellow = , Green = , Blue = , Indigo = , Violet = . ↑ Keith S. Walklet, 2006. Lunar Rainbows - When to View and How to Photograph a "Moonbow". The Ansel Adams Gallery. Retrieved January 12, 2009. ↑ Sea Water Rainbow. Atmospheric Optics. Retrieved January 12, 2009. ↑ Felix Billet, 1868. Mémoire sur les Dix-neuf premiers arcs-en-ciel de l'eau. Annales scientifiques de l'École Normale Supérieure 1(5):67–109. Retrieved January 12, 2009. ↑ J.K. Sassen, 1979. Opt. Soc. Am. 69:1083. ↑ Les Cowley, Circumhorizontal arc. Atmospheric Optics. Retrieved January 12, 2009. ↑ Rainbows on Titan. Science@NASA. Retrieved January 12, 2009. ↑ 8.0 8.1 8.2 Hüseyin Gazi Topdemir, 2007. Kamal Al-Din Al-Farisi’s Explanation of the Rainbow. Humanity & Social Sciences Journal 2(1):75–85. 77. Retrieved January 12, 2009. ↑ 9.0 9.1 J.J. O'Connor and E.F. Robertson, 1999, Kamal al-Din Abu'l Hasan Muhammad Al-Farisi. MacTutor History of Mathematics archive, University of St Andrews. Retrieved January 12, 2009. ↑ Carl Benjamin Boyer, 1954. Robert Grosseteste on the Rainbow. Osiris 11: 247-258. 248. ↑ Nathan Sivin. 1995. Science in Ancient China: Researches and Reflections. (Brookfield, VT: Variorum, Ashgate Publishing. ISBN 9780860784920), 24. ↑ Paul Dong. 2000. China's Major Mysteries: Paranormal Phenomena and the Unexplained in the People's Republic. (San Francisco, CA: China Books and Periodicals, Inc. ISBN 0835126765), 72. ↑ Nader El-Bizri, "Ibn al-Haytham," in Thomas F. Glick, Steven J. Livesey, and Faith Wallis, (eds.) 2005. Medieval Science, Technology, and Medicine: An Encyclopedia. (New York, NY; London, UK: Routledge. ISBN 9780415969307), 237-240. ↑ Nader El-Bizri, "Optics," in Josef W. Meri, (ed.) 2005. Medieval Islamic Civilization: An Encyclopedia, vol. II. (New York, NY; London, UK: Routledge. ISBN 9780415966900), 578-580. ↑ Nader El-Bizri, "Al-Farisi, Kamal al-Din," in Oliver Leaman, (ed.) 2006. The Biographical Encyclopaedia of Islamic Philosophy, vol. I. (London, UK; New York, NY: Thoemmes Continuum. ISBN 9781843711483), 131-135 & 248-255. ↑ Michael W. Davidson, 2003, Roger Bacon (1214-1294). Florida State University. Retrieved January 12, 2009. ↑ Carl B. Boyer, 1952. Descartes and the Radius of the Rainbow. Isis. 43(2):95–98. ↑ Stanley David Gedzelman, 1989. Did Kepler's Supplement to Witelo Inspire Descartes' Theory of the Rainbow? Bulletin of the American Meteorological Society 70(7):750. Retrieved January 12, 2009. ↑ J.J. O'Connor and E.F. Robertson. 2000. Sir Isaac Newton. University of St. Andrews. Retrieved January 12, 2009. ↑ H. Moyses Nussenzveig, 1977. The Theory of the Rainbow. Scientific American 236:116. ↑ A.A. Mills, 1981. Roger Bacon's Theory of the Rainbow: Progress or Regress? Notes and Records of the Royal Society of London. 36(1):13–36. Retrieved January 12, 2009. ↑ Bleicher. 2004. "However, most people can only discern six of these hues; they have trouble telling the difference between indigo and violet." Bleicher, Steven. 2004. Contemporary Color: Theory & Use. Clifton Park, NY: Thomson Delmar Learning. ISBN 1401837409. Boyer, Carl B. 1952. Descartes and the Radius of the Rainbow. Isis 43(2):95–98. Boyer, Carl B. 1987. The Rainbow, From Myth to Mathematics. Princeton, NJ: Princeton University Press. ISBN 0691084572. Dong, Paul. 2000. China's Major Mysteries: Paranormal Phenomena and the Unexplained in the People's Republic. San Francisco, CA: China Books and Periodicals, Inc. ISBN 0835126765. Greenler, Robert. 1980. Rainbows, Halos, and Glories. Cambridge, UK: Cambridge University Press. ISBN 0195218337. Lee, Raymond L. and Alastair B. Fraser. 2001. The Rainbow Bridge: Rainbows in Art, Myth and Science. New York, NY: Pennsylvania State University Press and SPIE Press. ISBN 0271019778. Lynch, David K., and William Livingston. 2001. Color and Light in Nature, 2nd edition. Cambridge, UK: Cambridge University Press. ISBN 0521775043. Minnaert, Marcel G.J. 1973. The Nature of Light and Color in the Open Air. New York, NY: Dover Publications. ISBN 0486201961. Minnaert, Marcel G.J. 1993. Light and Color in the Outdoors. New York, NY: Springer-Verlag. ISBN 0387979352. Naylor, John. 2002. Out of the Blue: A 24-Hour Skywatcher's Guide. Cambridge, UK: Cambridge University Press. ISBN 0521809258. Nussenzveig, H. Moyses, 1977. The Theory of the Rainbow. Scientific American 236:116. Sivin, Nathan. 1995. Science in Ancient China: Researches and Reflections. Brookfield, VT: Variorum, Ashgate Publishing. ISBN 9780860784920. National Center for Atmospheric Research, About Rainbows. Atmospheric Optics website by Les Cowley. Description of multiple types of bows, including: "bows that cross, red bows, twinned bows, colored fringes, dark bands, spokes," etc. Spectacular rainbow at Elam Bend (McFall, Missouri). Straight Dope on double rainbows. This page was last modified on 23 June 2015, at 16:13.